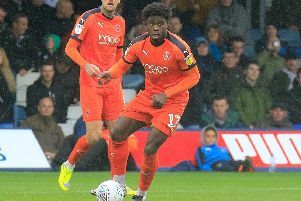 Town attacker Elliot Lee has been backed to start firing for the Hatters once more by boss MIck Harford. He has now gone 18 games without a goal, but came close at Bristol Rovers last weekend, skying over the bar from close range, while he also had a handful of efforts in the 4-0 win over Doncaster too. Harford said: “He’s a massive threat playing in that position. “Elliot’s good as a number 10. He hit the bar the last home game, he got in some good positions on Saturday, the one he scooped over on Saturday, it got a slight deflection as it was coming towards him. "I think if it hadn’t have done that, he would have put it in the net. “We just keep asking Elliot to get in those goalscoring positions, get in positions where he can hurt the opposition. Lee’s drought could be helped out by both full backs Jack Stacey and James Justin this afternoon, with the pair bombing forward on either flank to create a host of opportunities for their team-mates in recent matches. Harford added: “That’s what they are, attacking full backs. “We play a certain way which enables them to get in high positions and when they’re in high positions, they’re a real threat, in terms of assists, scoring goals themselves, which Jack has done. "JJ at Bristol Rovers, he got into those high positions on numerous occasion and hopefully we can carry on with that. "Teams try to nullify it in certain ways, but the boys seem to counteract that. "Sometimes you have to put the reins on them and keep them back. "Sonny (Bradley) and Matty (Pearson) have a bit of problem keeping them back at times, but we do look to get our full backs forward and they’re as massive when they do."